One of the recurring questions during AML interviews is whether you ever took a hiatus from the hobby due to "cars and girls." Well, I've got a Missus (so no girl distractions, of course), but I will admit lately to a car distraction. Between that and my usual busy time at work, my modeling time has suffered a bit. But with a long weekend coming up, I decided to get my feet wet again with something fun and quick - labeling my throttles! Now, before you think me TOO crazy, just remember that for somebody with undiagnosed - but occasionally severe - OCD, labeling things is always a good time. Bonus if the labeling is actually helpful & useful. 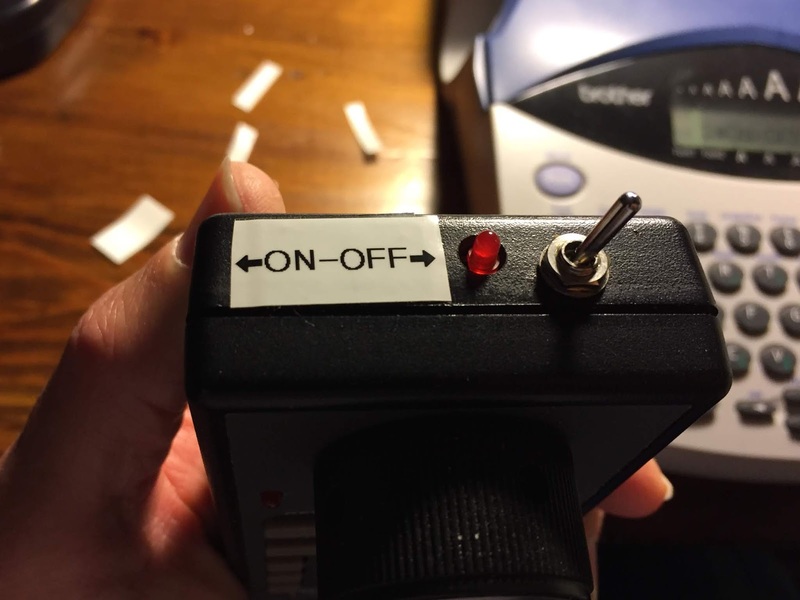 Soooo..... since I'd noticed during my operating sessions that folks would often ask me how to turn on my NCE radio throttles (either because they're unfamiliar with NCE or they just forgot), I figured I'd just put the directions right on the back . . .
For a large "label" like this, I just typed up and printed out the instructions using Word, and then affixed it to the back with clear packing tape. 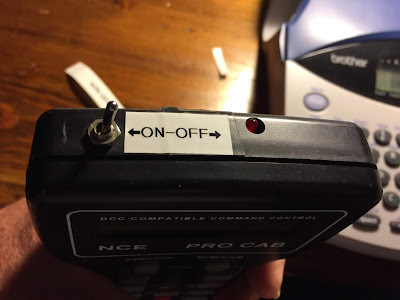 This is the back of the NCE Cab04pr radio throttle, outfitted with a handy-dandy on-off toggle that I installed myself when I removed the external whippy antenna and substituted an internal wire antenna. I also added a piece of Scotch tape to keep the back attached and make it easier to remove as well. And here is a similar label on the back of an NCE ProCab throttle (actually, this one is the PowerCab, but the layout is the same). Craig Bisgeier gets the prize for being the first to ask "What Toggle?" when I posted this photo earlier today on the Valley Local Facebook Page (you do know that there's now a FB group for the layout, don't you? Be sure to check it out and join!). Truth is that, in my eagerness to stick the label on the back of a dogbone throttle, I grabbed the first one on-hand, not realizing until afterwards that I'd grabbed the wired/tethered PowerCab throttle instead of the wireless ProCab. No worries - I just peeled off the label and put it on the correct throttle. Speaking of which, here is the actual ProCab throttle with the noted toggle. Like with the Cab04pr, I removed the whippy antenna, installed an internal wire antenna, and also installed an on/off toggle to save battery life. Click here for that project. 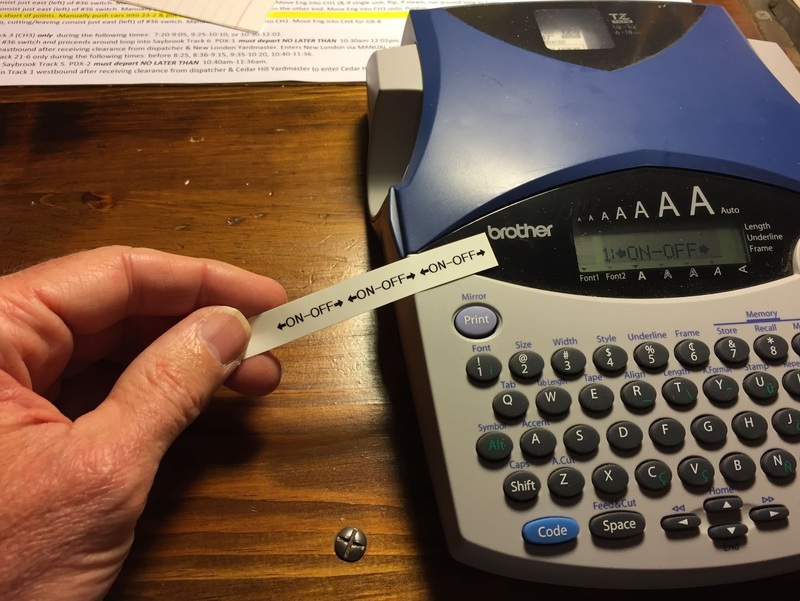 And since my new instructions mentioned flipping the toggle to the "on"position - and since that's not entirely intuitive on the throttles themselves - I used my favoritist OCD tool to make some labels (thanks again to RomanD for the labeler loan!). Just a matter of typing out three labels together, cutting them out, an putting them on the throttles near the toggles. Now that that fun is done, I've got a bit of motivation to make some more progress on my other layout projects. After my recent distraction, I discovered very quickly that model railroading is a lot less expensive than racing cars. Heck, for the price of a larger intercooler, I could treat myself to another brass steam locomotive . . . . Hmmmmm . . .
DEY-3 (an Alco S-1?!) on a passenger train. Date, location, and photographer unknown. Long-time readers may recall that an essay by Tony Koester - describing a photograph by Kent Cochrane - was one of the primary inspirations for my modeling the Valley Line. The photo showed the southbound Valley Local, shot from "model railroader's perspective," entering Middletown. But it was Tony's prose that really brought the photo to life. Click here for that story. The reason I mention this now is to provide just one example of how big a fan I am of Tony's long-running "Trains of Thought" column in Model Railroader magazine. He has a way of putting into words some of the more cerebral aspects of our hobby and, whether you agree with his perspectives or not, he never fails to make you think. I don't know exactly when he first started the column, but I can guarantee you that I've read & enjoyed every one. Heh - I've even attempted a (an?) homage to his idea on my website. So imagine my surprise when I got the latest (May) issue of Model Railroader. As is my custom, I always start reading from the back - where "Trains of Thought" appears. And there was a photo of Old Saybrook - from my layout! Even better, he relayed a conversation that he and I had a while ago talking about the so-called "debate" between Prototype Modeling & Freelancing (Spoiler Alert: There isn't as much difference as you think). Seeing my name in Model Railroader was a real treat, but seeing it in "Trains of Thought" was especially cool. If you don't get MR, I hope you'll at least get this copy - even better if you chime in with YOUR train of thought on the topic of "Compromise vs. Opportunities." Whether you fancy yourself a freelancer or a "true" prototype modeler, there's lots here to mull over - and you might be surprised to discover that you're probably a little bit of both. East Berlin, that is - and the Stanley Chemical building. In keeping with the cruelty of April Fool's day, I just realized that I actually started this project way back on February 11 and still haven't finished it. I clearly have my priorities misplaced (and, due to some early spring-like weather, I've been distracted doing Mustang things). The mockup is in the background and I've assembled the walls to match, using liquid styrene cement applied on the back. Even before doing that though, I made certain any flash/parting lines were removed and I sanded off any blemishes left by removing the parts from the sprues. In the pic above, you can see I already shrunk the right end wall down to just one wall width wide. And I'm test fitting the larger end wall to be sure that the corner cornice is perfectly square. Next, I figured out what parts I needed for the foundations and put those together. Then, the loading docks and stairways. Not working from any plan or photo, it took me a surprisingly long time to decide where I wanted the loading docks, doors, and stairways. But I finally came up with an arrangement that I think makes sense. Since there's no longer any loading door the the right end wall, I contrived a third car spot by adding additional dock space by the front/office door on the left end wall. This loading dock will be able to serve trucks as well as rail cars. Next, I turned my attention to the base. In order to accommodate such a long building, I had to splice on an additional "square" of base material. I just butted the ends of the addition to the edge of the other base and added liquid cement. But that alone wouldn't be a strong enough joint, so I added the triangle brace/splice you see above and, using my end walls as a guide/template, I figured out where the bottom of the back wall would be and added another long strip of styrene as an additional brace. Figuring out the windows and doors was an easy matter of matching what I had to what I needed. The only note on these (other than the usual sanding away any sprue gate blemishes) was to carve off the part numbers from between the windows. This is the area that's glued to the back of the wall so I wanted to be sure it would mate perfectly. I wanted to get as much done before painting as possible, putting things together in subassemblies and sorting them into different boxes by color - rusty red for the brick parts, black for the roofs and supports, green for the windows & doors, concrete color for the foundations/docks/stairs. One of those subassemblies was the loading dock roofs, supported by these cool triangular parts. They come with locating pins, but there are no holes pre-drilled on the walls and I didn't feel like drilling all those holes perfectly vertical and the perfect distance apart. So I just removed the locating pins. I'll use some thicker, slower glue to attach these to the walls. That way, I can move them into perfect position when I attach them. To actually assemble the loading dock roofs, and make sure the supports were as perfectly perpendicular as possible to begin with, I used my handy-dandy "Square Leveler (tm)" :^) In fact, it was this little step in the assembly that prompted the creation of that tool to begin with. Assembling the chimney was pretty straightforward (four sides with beveled edges), but I did sand off the locating pins since they actually prevented the corners from fitting tightly. Then I cut out all the parts to do the exhaust fans and cleaned those up. Interestingly, those little buggers actually ended up being a bit frustrating to assemble. For this week's edition of Friday Fun, one of my regular operators, Pieter Roos, sent me his latest video of the Valley Line which he shot during last June's operating session. Click here for the report I did on the session itself, and just click below to enjoy a great video of some of the trains that ran that day. I hope you enjoy it as much as I am - thanks very much Pieter!